Gotham Ghostwriters: Writer Poll: Are We in a Golden Age of Writing? 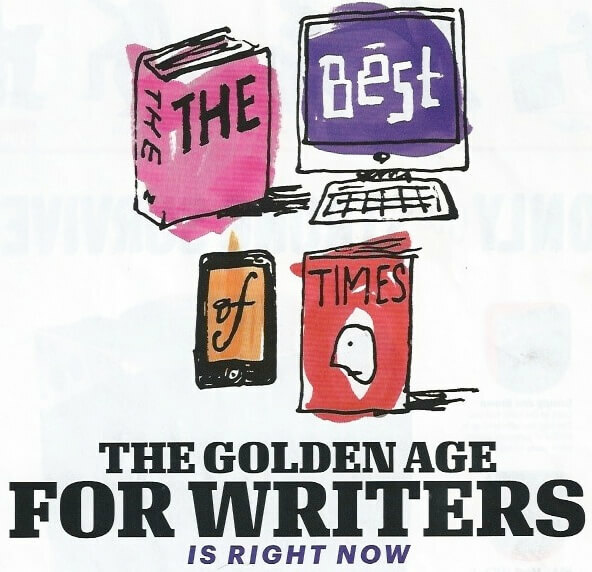 Writer Poll: Are We in a Golden Age of Writing? Esquire recently published a piece called "The Golden Age for Writers," which argues that writers have no idea how lucky they are to live in these times of plenty for all things surrounding the written word. Evidence cited for this claim includes new blockbusters coming out this year by powerhouse writers like Salman Rushdie and Zadie Smith, the fact that J.K. Rowling is a billionaire, and the way Fifty Shades of Grey has swept the world. In addition, publisher revenues are up, and there is more excellent long-form writing available to more people than ever before. The crux of the piece: "Literary circles have been so full of pity for so long that they can't accept the optimistic truth: We're living in a golden age for writers and writing." Did Esquire miss something major in their relentlessly rosy assessment? Or is it time for everyone to stop howling about the death of the written word? We decided to go straight to the source and ask our vast network of hard-working writers to weigh in. I totally agree. The article didn’t even touch on our ability to put out our own ebooks at will and sell them on Amazon, one of the largest search engines online. Writers now are truly blessed! Yes, everything is going digital but websites can't function without words. I'm constantly approached by businesses looking for words for their social media, blogs, or websites. Marketing copywriting and social media writing can earn you a steady income while you focus on passion projects on the side. There are many writers (like Diablo Cody, Amanda Hocking, and Kelly Oxford) who found success through social media and self-publishing. There are few barriers holding us back. We can market and publish ourselves, which brings an insane amount of opportunity for writers. I think we are at the beginnings of a golden age for writers due to the proliferation of paths by which writers can get their work in front of readers: print on demand, partner publishing with companies like Greenleaf Book Group, funding via sources like Kickstarter and PubSlush, direct-to-ebook publishing via the Kindle store or through companies like BookBaby, and so on. For ghosts, more paths to publishing means more people writing books and more quality work for us. Sure, doing all your own marketing is a lot of work, but since when was being a successful writer not a lot of work? I think this is a great time to be a writer, so long as you're entrepreneurial. We are witnessing a resurgence for authors as we have grappled with and figured out ways to take advantage of new technologies and the Internet. As a ghostwriter, my business is certainly increasing. Yes, I too suffered through the doldrums of believing our industry and our very lives were heading over our own fiscal cliff. But all the way back in 1995, my MFA writing professor announced that we students were getting into the writing business just as it was dying. Perhaps people perpetually make these claims to discourage others, to thin out the herd. Certainly the availability of written works in electronic form and new advances in self-publishing are both good for writers. But the Internet and social media have enticed regular people (not professional writers) to do much more writing than ever before. Vast numbers of people are writing more than ever, because they have the motivation that every English comp instructor has struggled for so many years to provide: to write about something you know and care about and have some aim or purpose with regard to the reader. The world is now one big writing workshop! Content is still king, but all of us who deal in content—one way or the other, in any venue—are trying to figure out the new rules of the game. And we have to start from the position that even if we do figure out the rules today, they will be very different in a year’s time. So yes, there are more outlets, but we face a lot more complications and the road map isn’t clear. I agree with the premise on one side: There are now, thanks to the Web, an infinite number of outlets for anybody who wants to express an idea or tell a story. On the other side, while I see that for authors who hit it out of the park, there is more visibility to be had, a larger audience of readers, and more money to be made than ever, the question is, is this not a zero-sum game? I think the long-term answer is going to be that writers will become entrepreneurial and learn to use the Web and other tech to promote and distribute their own work. But in the interim, as with every other media business, writers will face more suffering before it gets better. I do not "howl self-pityingly" about "the death of the written word"; I've put two daughters through college as a freelance writer. However, the Esquire view is just nutty. Writers today are expected to produce work for close to nothing! But the good news is that, because of the enormous demand for content to fill digital media, it is much easier today to get some stories published and have a bunch of published clips to show. Yes, developments in technology, blogging, and social networking have made it simple for anyone who shares a thought or a comment to become a "writer." Does that make it a golden age for writing, though? This is doubtless a time of great quantity, but what about quality? I believe we should aspire to a golden age of literacy, which would benefit writers, publishers, and readers alike. If the Fifty Shades books are responsible for the rising numbers, discount those numbers. Those books are dreck. And in any case, sales are one thing, but income for writers from those sales is another. To the extent that the numbers reflect Amazon's long tail, they don't help writers much. Mid-list advances and income are incontrovertibly down (although the long-tailers and mid-listers never made enough anyway). For readers, though, it's tough to complain. Except for the fact that writers are making far less than Esquire paid in the 1960s and '70s, this truly is a “golden age”—for publishers. All that the Esquire piece seems to argue is that life's not so bad if you're Jonathan Franzen. If the author of the article had talked to more mid-listers or hopeful talents who can't get their first fiction placed among the Big Five, he might have reached a different conclusion. Sure! Golden age! Unless you're interested in pesky things like, oh, getting paid. And I would point to Esquire's own website, where they pay a WalMart-like $150 for a 1,000-word piece. Where do I apply for food stamps again? What do you think of our writers' conclusions? Tell us in the comments. And by all means, keep writing!